A small space is the equivalent to the front page of a newspaper—there’s limited space, so everything is competing with one another. Follow the newspaper design principle of having a “Center of Visual Impact”: your one piece that is larger and more dynamic than the rest, like the bright red Ligne Roset couch pictured. Resist the urge to throw more loud pieces into the same room to make up for the cramped space. They will only result in chaos, making visitors feel trapped in the dissonant mess that will be the decor scheme. 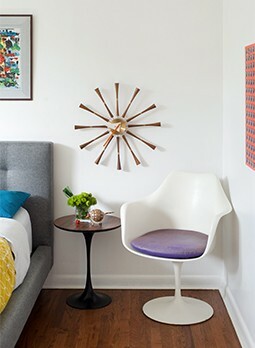 You want bold midcentury design, not an uncomfortably loud space. Avoid occupying your compact space with multiple flamboyant furnishings—but don’t feel the need to tone down all your pieces. You can still have fun; the key is subtlety. The dining set pictured is a simple white that is harmonious with the walls, but features a fun lemon wedge design on the table. The interesting detail makes the space more playful and distracts from the room’s low square footage count. Incorporating appropriate quirky accents is also a fun opportunity to bring in unique vintage pieces. Idiosyncratic is not just synonymous with flashy colors and funky prints. Counterbalance the two with a uniquely-shaped piece, like the surfboard table above designed by Patrick Boyce. The surfboard table, and other furnishings in similar interesting molds, introduces another visual point of interest into the room while barely taking up floor space. The best part about rugs is that they instantly amp a room without crowding out other pieces—they just sit underneath them, after all. A shag rug adds a different texture into the room, making the room only more bold. Now, not everyone can swap out their existing walls for glass panels. But if your situation allows you to, or you’re forming the blueprints for a minuscule ranch, then opt for transparent walls. Rather than give the effect of enclosing in on you, the glass panels open onto the nature outside and therefore inspire the illusion of a wider room.